Thursday, February 7, 2019 . WARNING THIS IS LONG POST, GRAB A BEVERAGE OF YOUR CHOICE AND HAVE A SEAT. Last year, our daughter had talked to her dad and I about Swedish Death Cleaning . I know, horrifying concept right? Dying. But it’s actually a great concept. You can read about it here. Here’s the concept in a nutshell: as you age you should simply your life. When you’re young and have kids, it’s natural to have clutter. But as you age, you should work on getting rid of possessions. This is the ultimate kindness to your children and family. With my daughter living at home and pushing for another purge, I decided we needed to revisit the entertaining pantry (I have 2 of them)–lots of platters, plates, coffee makers and cups and saucers and bowls and decorative trays, baskets and bowls and bowls and bowls. She and I tackled the pantries. It took us 2 days to excavate the items and rearrange everything. Believe me, it was not smooth sailing. She was merciless and ruthless in her editing. Yes it’s true, even I have to have some things pried out of my hands. I love organizing, and I think everyone needs to do more of it, everyday and every week of the year. That’s why I was very excited to see that Marie Kondo was getting her own organizing show on Netflix. Marie Kondo is a Japanese organizational guru. Her show “Tidying Up” started streaming January 1st on Netflix – perfect timing for organizing and cleaning right? A little about Marie… Marie Kondo achieved worldwide fame in 2014 when her first book, The Life-Changing Magic of Tidying Up: The Japanese Art of Decluttering and Organizing, was translated into English and published in the United States, where it became a New York Times best seller and sold more than 1.5 MILLION COPIES!!! My take on her show...anything that brings awareness to cleaning up your stuff brings me great joy! Anything that makes YOU think about purging and cleaning is a good thing in my book. On to the show…Marie shows up with her translator and briefly speaks to her clients through a forced smile. First things first, she “introduces herself to the house” by doing some kooky made up woo woo ritual which involves her meditating when kneeling on the floor. I am an organizing freak and wanted to love the show! But honestly, I found the show very boring. Her offerings are superficial fixes. She never addresses the real issues–like what to do with paperwork? She never talks about technological fixes like a scanning paper and becoming paperless. Instead she has people put things in paper boxes? Huh? She’s very simplistic, and of course, very Japanese in her approach. No one ever reminds her that Americans do not live like the Japanese, we have larger spaces and as a result, MUCH MORE JUNK. Her show features clueless band-aids on the epic problems of the obsessive, non-stop-buying culture of America. Though entire show, I wondered what she really thought of our culture of hoarding and buying beyond our means compared to the pared-down lifestyle in Japan. I am sure she thinks it is horrible! But her face cracking smile never lets you know what she is thinking. Mostly it just got on my nerves. Basically, Marie offers small boxes to people that have BIG box problems. The best thing about this show is that purging and cleaning is now the part of a larger discussion in America. And people are indeed looking at their stuff and assessing and tossing and donating it. For us, the Swedish Death Cleaning lifestyle is a better fit, but if Marie’s method is your style, go for it. The truth is: We all need a complete paradigm shift in how we shop, how we consume, and how we teach our children to live. Thursday, May 5, 2016 . First things first…when you build a prop stash, you need to make sure you shop like a stylist. Pick props that are basic as well as pick props that are unique. You should have a complete color wheel of fabrics and napkins to coordinate with plates and bowls of all sizes and colors. I keep buying white and natural napkins which I do not need! Don’t be like me! Shop for what you don’t have, and when you see napkins to add to your collection, grab them. My message here is don’t keep buying the same napkins (or props) over and over again. The numero uno rule of being a professional stylist is to be efficient and organized. Once you start to seriously collect your prop inventory, you will find that storage is key. It’s important that everything is easy to access and most important is that you see everything displayed clearly. Pay attention to this tip! Utilize amazing storage! 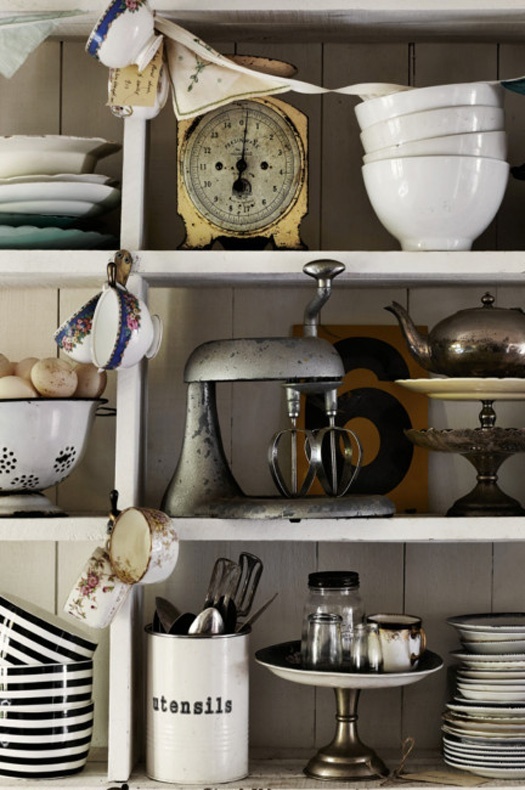 Having a great place to pull from when you need accessories to style a room or to prop a recipe is key. I use metro fixtures which are available online or from The Container Store. They are sturdy and affordable. I also use vintage bakers racks. As long as you have a centralized location for your prop stash, you’re in business. For example: here is a great collection of unique props. Store them all together, in a safe location on your shelves. Here’s another tip: use them a couple of times and then trade them with another stylist or antique dealer. I keep the ones that are so special I will never come across them again and rent them to other stylists. Having a unique vintage scale is a must, old pitchers, and a stash of vintage bake goods. Store these items together. When thinking about organizing, store like with like. In other words, I store all my galvanized props together, and plates stacked by color and size. Think like a retail store and create color stories and stories by material. For storing fabric: I think airtight see-through boxes are an easy solution. I stack the boxes on shelves and they are organized by color. Because I can see through the boxes I know which color napkins to pull down for a shoot. (*Remember to air them out regularly to prevent mold and mildew and wash them after every use.) A dresser will work as well for this kind of storage just make sure to colorize your napkins and tablecloths and remnants. Here’s how I organize my prop stash: I have shelves in my garage, and I merchandise my shelves neatly by color and material. I also purge regularly. Just like styling a photograph, it’s important to edit your props as well. I try not to use a prop more than twice, you’d be surprised how many people notice when you use the same prop over and over again. You don’t want to be that photo stylist; you’re a pro. I store all my flatware in a filing cabinet, with narrow drawers Like this one from the Container Store. I like to store trays and surfaces stacked in a rack and store small things in jars and vases. Remember you are spending lots of money on your things (even if you’re shopping flea markets… it adds up! ), so take good care of your prop stash. Let me know if you have any organizational questions in the comments below, and I will be happy to answer them. Happy Shopping and Propping! Monday, April 18, 2016 . As most of you know, our next workshop is coming up quickly and will be happening in June. What you might not know, is that I am off to Italy in just a few short days. I am going to do some more house hunting, research for future workshops, take my own workshop (yes, I like to learn, too), and prepare for our Italy workshop. Lots to do! When I travel to Italy for the summer, I concentrate on packing items that are comfortable and chic, but still very practical. I wanted to share some of my favorite things to pack for Italy to inspire some of my workshop attendees (yipee!) and to inspire you to think about your own travel wardrobes. What are your must-have items when traveling in the summer? I’d love to hear what your must-packs are! Thursday, December 17, 2015 . As you know, one of the best ways to be a relaxed hostess is to be an organized hostess. One of the best ways to assure that you are relaxed is to start to collect all the elements of a party in one place: plates, glasses, platters, serving pieces, flatware, and linens. This way you can pull everything together for your parties from one location. First of all, don’t buy a thing! I want you to look at what you own. Here are the basics you will need to create any party. I want you to look at everything in your home, things in your living room and den, even the things in your bedroom and foyer or garage, and yes, of course, the basement. I want you to shop your home for useable objects and items; think about repurposing and using things in a whole new way. 3 Trays or flat objects that are food safe and could be scrubbed and used to plate or gather food. I love white enamelware; I find mine online or at flea markets. 1 rectangle, 1 square, and 1 round. 12 Glasses, anything goes! The more mismatched the better. 12 Wine glasses, both red and white, 12 champagne coupes, and 12 champagne flutes. These can be from a flea market and mismatched. 2 Wood surfaces, like planking or old cutting boards. 1 rustic and 1 smooth. 4 Tiles; old tiles can be used as platters for cheese or appetizers. 2 Chalkboards and old signs; anything that you could write on to use to write menus or messages to your guests. Ribbon, string, yarn, twine, and raffia. Wrapping paper; it makes great table runners, or use it for wrapping vases. Galvanized or enamel buckets. Great for flowers, napkin rolls, breadsticks, or French bread. 1 large, 1 medium, and 1 small. Bottles and jelly or mason jars (I like to save jam jars and run them through the dishwasher), all sizes. 1 of each small, medium and large plates and platters. 3 of each small, medium, and large bowls. Metal containers and wood containers. 4 of each small and medium wood crates, or small fruit crates/baskets from the grocery. 3 yards of each old pieces of fabric for runners and table cloths; burlap from the garden shed. Old napkins and tablecloths (I like to over dye old, thread bare linens). Muffin tins and old baking pans. 12 white bowls for soup, dessert, or salad. 12 knives, fork, spoons, dessert spoons, and dessert forks. Small wooden servers for jams and spreads. Mismatched flatware for serving meats and condiments. 12 white and natural linen napkins *If you do not have these, you should purchase them. Linen tablecloths: 1 white and 1 dark linen *If you do not have these, you should purchase them. 2 white cake plates, small and medium. 1 colorful cake plate. Pie server and ice cream scoop. 8 placemats. I only like placemats for breakfast or lunch, or a very casual dinner. NOT parties. Make sure you have a place to store all of your essentials together. I have an actual room, but you can buy great shelves and pick a place in your own home; it can even be the garage or your basement, or a spare closet or room would do nicely as well. Above is my party pantry and below is a great closet you could replicate. The most important idea is that everything is in one place for easy access.